Among the torrent of news coverage of Margaret Thatcher’s death there has been little mention of the deadly consequences of her policies on countries of the South. When Ronald Reagan died in 2004 Margaret Thatcher applauded her great friend and fellow ideologue by commenting that he was ‘responsible for winning the cold war without firing a shot”. Behind this world view, uncluttered by facts, lies the reality of the deaths of millions of people. In Central America alone an estimated 300,000 people lost their lives as the Reagan administration attempted to drive ‘communist’ influence out of its ‘backyard’- aided and the abetted by the special relationship that Thatcher enjoyed with Reagan. In the case of Nicaragua, the Thatcher government was the key European ally in US attempts to destroy the Sandinista government. In 1986 the Iran contra scandal erupted: the Reagan administration illegally sold arms to Iran and used the proceeds to fund the contras during a period from 1984-86 when Congress had imposed a ban. The Tower Commission report into the scandal revealed UK involvement in a network providing arms to the contra through KMS, a London based security firm. Throughout the 1980s the Thatcher government supported the US strangulation of the Nicaraguan economy by dramatically reducing or cutting aid and trade. A document leaked from the Overseas Development Administration – now the Department for International Development – dated 12 October 1984 reveals the voting policy of UK in international lending institutions: ’we continue to oppose proposals for Nicaragua by finding technical reasons for doing so’. As Margaret Thatcher’s funeral takes place in London this Wednesday our thoughts are with the tens of thousands of Nicaraguans who suffered the consequences of US foreign policy – aided and abetted by the Thatcher government. Latin American leaders have reacted to the death of Margaret Thatcher luke-warmly, in contrast to the gush that has filled the airwaves and printed page in the UK. Most have obeyed strict formalities, noting her passing, and recognising her impact on international politics. There have been some exceptions though. Stamp issued by government of Violeta Chamorro – a Sandinista version is unlikely! In the Maggie camp the neo-liberalistas from Mexico, Chile and Colombia have joined the glorification. Argentina, because of Las Malvinas, have either ignored her death completely, or shown hostility. The gritted teeth response from most of Latin America was to be expected. Thatcher was a friend to, apologist and cheer-leader for General Augusto Pinochet, one of a number of fascist dictators who received her blessing. She was not only a fan of their hard line (as in torture, death squads and state sponsored assassination) with the Left. She was also an admirer of the neo-liberal economics introduced to Chile by Milton Friedman’s Chicago Boys. Together with Reagan, the IMF and the World Bank, she promoted this as the ‘Washington consensus’ to the world. Savage cuts in public spending, privatisation and the destruction of trade unions were road tested in Latin America. It led to Latin America’s ‘lost decade’ – economies shrunk, and real wages in urban areas contracted by between 20 and 40 per cent. Thatcher’s role, usually, was to be the lapdog of US Foreign policy. She supported the invasion of Panama, and branded Nelson Mandela’s ANC ‘a terrorist organisation’, whilst enjoying warm relations with the Apartheid regime. She supported the US attacks on Nicaragua and backed the Contras from the start. Mark Curtis has detailed the ‘nod and wink’ support the Thatcher government gave to UK security company KMS, involved in training the Contras and gun-running. This became the game plan for the UK, taking a similar approach to Afghanistan, supporting the mujahedeen against the Soviet Army (elements of which would, of course, morph into the Taliban and Al-Qaeda). This more covert approach also extended to the domestic field, at least as far as Foreign policy was concerned. In 1987 Adolfo Calero, a Contra leader heavily involved in the Iran/Contra scandal, was invited to the UK by the Committee for a Free Britain. The trip also included a visit to the House of Commons, organised by Tory MPs. 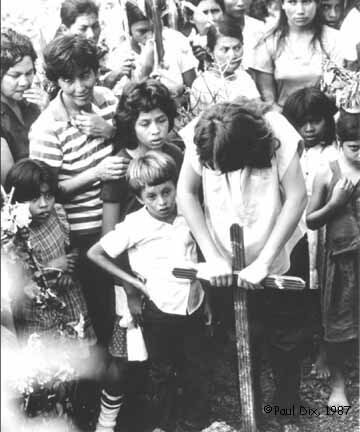 Daughter Yamileth, at 15, cries over the grave of her mother, Carmen Mendieta, who was killed by contras on the road to Rio Blanco on December 2, 1987. The Committee (also known as the Campaign for a Free Britain) was a front for leading supporters of the Conservative Party, many of them with ties to Thatcher. It received funds from Rupert Murdoch. Amongst the main figures in the CFB were David Hart, advisor to Thatcher, and Christopher Monckton, a member of the Downing Street Policy Unit. Hart is one of the more ‘colourful’ (i.e. both dodgy and seriously scary) members of the Thatcher entourage. He was one of the main co-ordinators of getting miners to break the strike, including liasing with ex-members of the security forces. In later life he became involved in the arms industry, including having an arrest warrant issued against him for an African coup, and allegations in the Guardian that he took £13 million in secret payments from BAE Systems. In 1988 he shared a platform with Richard Perle at a CFB event. Perle was a Reagan offical, who would later become notorious for helping draw up the Project for a New American Century, which laid out the game plan for the invasion of Iraq long before Bush Jr took power, and highlighted how an international crisis (which was eventually the 9/11 attacks on the US) could be used to push through extreme measures both at home and abroad. 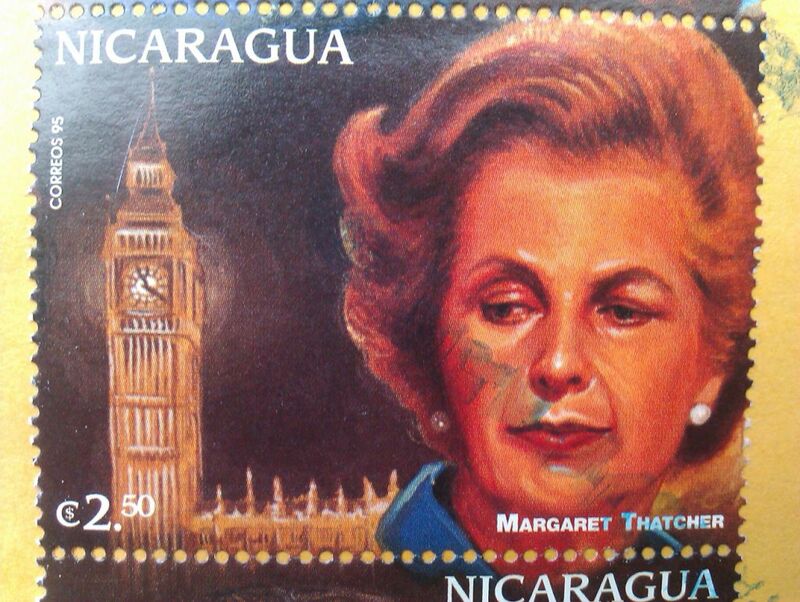 So what was the Nicaraguan response to the passing of Thatcher? Vice-President Moises Omar Halleslevens offerd this: “This English lady known as the Iron Lady was characterized for her tough hand and a raft of policies that I would say were coarse and crude for the people of that distant but brotherly country.” He also wished that “the Lord has her next to him”. Mae marwolaeth Hugo Chavez wedi cael yr ymateb arferol yn y wasg Brydeinig. Maent i gyd wedi ei bortreadu fel cymysgedd o wr awdurdol a chlown. Ymunodd un aelod penwag y twitterati Cymraeg, yn disgrifio Chavez ar ddiwrnod ei farwolaeth fel ‘unben’. Pam y dicter? Mae o leiaf dri rheswm. 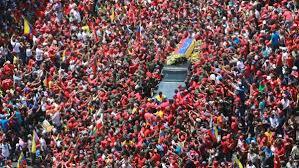 Er gwaethaf y cyhuddiadau hyn, credai Hugo Chavez mewn democratiaeth. ‘Roedd yn ddemocrat effeithiol a llwyddiannus. Ennillodd 13 o 14 etholiad neu referendwm. Disgrifiodd Jimmy Carter berianwaith etholiadol Venezuela fel “y gorau yn y byd”. Llwyddodd i oroesi coup yn 2002, ar ôl i arweinwyr y coup ddiddymu y Cynulliad, y Cyfansoddiad a’r Uchel Lys Uchel, gyda chefnognaeth yr Unol Dalieithau. Ond nid trwy’r Senedd a Swyddfa’r Arlywydd y datblygodd Chavez ddemocratiaeth. Ers 2006 mae 40,000 o gynghorau cymunedol wedi cael ei ffurfio, gan roi’r grym yn nwylo pobl gyffredin. Yr ail reswm pam mae rhai wedi ei gasau yw am iddo achub y gair ‘sosialaeth’ o hanes. ‘Roedd ei sosialaeth 21ain ganrif yn un ymarferol, di-ddogma. Yn ôl Chavez, ei nod oedd “math newydd o sosialaeth, un dyneiddiol, sy’n rhoi pobl a nid periannau neu’r Wladwriaeth o flaen popeth.” Yn Venezuela mae’r weledigaeth hon wedi arwain at wasanaeth iechyd am ddim, llythyrenedd i bawb, addysg am ddim at lefel prifysgol. Mae wedi hanerru y nifer o bobl sydd mewn tlodi, a dan Chavez, mae Venezuela wedi mynd o’r wlad lleiaf cyfartal yn America Ladin i’r wlad mwya cyfartal. Yn drydedd, helpodd Chavez i uno America Ladin. Sefydlodd Venezuela yr ALBA, bloc economiadd sy’n cynnwys Bolifia, Ciwba, Ecuador a Nicaragua. Ond trwy herio grym yr Unol Dalieithau mewn fforymau rhyngwladol (a chael ei feirniadu am wneud hyn), mae wedi caniatau pobl mwy ‘cymhedrol’ (fel Lula ym Mrasil) i ddatblygu llais cryf ac annibynnol i America Ladin, a dechrau creu cyrff rhanbarthol heb ddylanwad Gogledd America. Llynedd, ffurfiodd holl wledydd yr Americas (ar wahan i’r UDA a Chanada) CELAC, yn cynnwys llywodraethau o bob lliw. 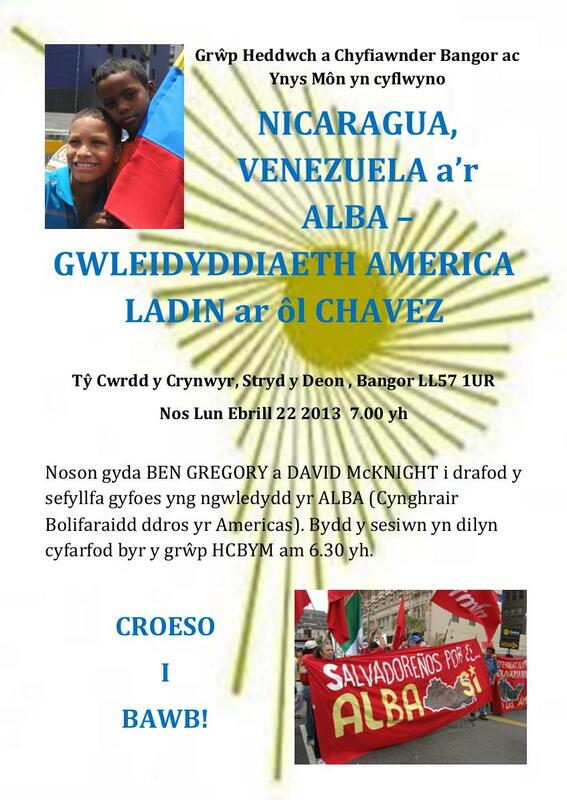 Roedd yn hawdd i Chavez ddylanwadu ar y symudiad i uno’r cyfandir, oherwydd fod Venezuela wedi dangos y budd ymarferol o gydweithredu. Mae cynllun PETROCARIBE wedi rhannu cyfoeth olew Venezuela gyda 18 gwlad. Trwy delerau da, a rhannu peth o’r elw drwy gronfeydd datblygu, mae Venezuela yn rhoi 1.5% o’i GDP fel cymorth rhyngwladol pob blwyddyn (mae Sweden ar ben y tabl ‘swyddogol’ cymorth rhyngwladol gyda 1%, mae UDA yn rhoi 0.2%). Yn achos Nicaragua, gwelais y gwahaniaeth gyda’m llygaid fy hun. Ariannwyd llawer o’r rhaglenni cymdeithasol – Dim Llwgu (gyda 100,000 o ferched yn cael arian i ddechrau ffermio a thyfu), Dim Usuriaeth (80,000 o ferched yn derbyn benthyciadau i ddechrau busnes), cynlluniau i wella ffyrdd a thai – gyda cymorth Venezuela. 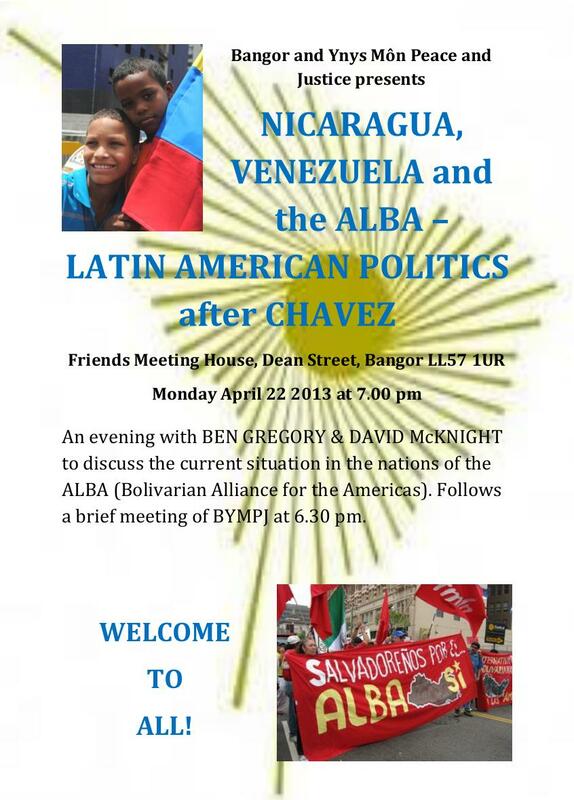 Mae Venezuela yn bell i fod yn berffaith. Mae problemau enbyd gyda llygredd, gyda’r sustem gyfiawnder, a throsedd. Nid yw gwelliant safon bywydau mwyafrif y wlad wedi cael yr effaith ar y problemau hyn yr oedd Chavez a’i Lywodraeth wedi gobeithio. Mae rheswm arall pam mae pobl mor llawn o ddicter at Chavez. Mae llawer yn Venezuela a thu hwnt yn credu na ddylai rhywun fel Chavez – oherwydd ei hil a’i ddosbarth – fod wedi arwain gwlad. ‘Roedd iaith Chavez yn ymfflamychol a lliwgar, iaith ei fagwraeth dlawd, iaith pobl gyffredin Venezuela. ‘Roedd hi’n amlwg fod Chavez o dras Ameindiaidd ac Affricanaidd, nid y bobl gaiff eu geni i arwain gwlad, neu cael chwarae teg yn y Wasg Orllewinol ac mewn twitterverse. Credaf y bydd pobl sy’n disgwyl gweledigaeth Chavez, ar lefel ei wlad ac yn rhyngwladol, ddatod yn cael eu siomi, oherwydd mae’r newidiadau wedi rhoi gwreiddiau dwfn yng nghymdeithas Venezuela ac mewn cyrff rhanbarthol. Mae’e erthygl hyn yn Barn mis Ebrill, gan Ben Gregory. Ymwelodd Siân Howys ar Nicaragua am y tro cyntaf ym 1994. Un deg naw mlynedd wedyn, dychwelodd i’r wlad. Cofnododd ei hargraffiadau am y newidiadau a’r sefyllfa presennol yn Cristion ym mis Ebrill. Wnes i ymweld â Nicaragua yn 1994 fel aelod o ddirprwyaeth cyntaf Ymgyrch Cefnogi Nicaragua Cymru. Cafodd y mudiad ei sefydlu yn 1986 i gefnogi chwyldro y Sandinistiaid i ymryddhau’r wlad o deyrnasiad gormesol ac unbeniaethol y teulu Somoza. Angharad Tomos a’m perswadiodd ac roedd yna bedwar ohonom yn aelodau Cymdeithas yr Iaith – Selwyn Jones a ‘Rocet’ Arwel Jones oedd y lleill- roeddem yn awyddus i ddeall ymgyrchu dros y Gymraeg o fewn cyd- destun brwydrau byd eang. Fe ges i hefyd nawdd gan fy undeb UNSAIN fel Gweithwraig Gymdeithasol gan y byddem yn cysylltu gyda grwpiau undebol ac yn trafod hawliau gweithwyr a gwasanaethau llês a gofal i grwpiau bregus. Roedd Peter Heneker, gweithiwr CAFOD hefyd yn aelod o’r ddirprwyaeth ac yn wir roedd ffydd a gweithredu Cristnogol yn sbardun i nifer ohonom yn enwedig o ran dysgu mwy am agweddau ar ddiwinyddiaeth ryddhâd. 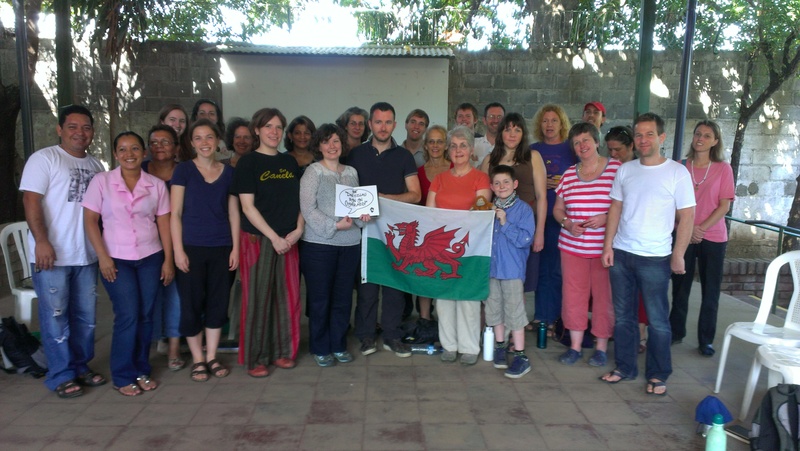 Roedd y daith gynta yn un bwysig i Ymgyrch Cefnogi Nicaragua Cymru. Gwnaethpwyd cysylltiadau ystyrlon gyda sawl phrosiect a mudiad ac yn enwedig gydag unigolion a grwpiau ar Arfordir Caribi y wlad. Rhoddodd yr ymweliad hwb i’r gwaith cefnogi a dwi’n cofio inni fynd o gwmpas yn siarad gyda sawl cymdeithas a chynulleidfa capel yn codi ymwybyddiaeth am yr hyn welsom – tlodi eithafol ac anhawster difrifol y mwyafrif i gwrdd â gofynion sylfaenol bywyd yn sgil dychwelyd Llywodraeth Neo – Ryddfrydol yn yr etholiadau rhydd cyntaf a gynhaliwyd yn y wlad. Y neges fawr oedd maint y gwelliannau a gyflawnwyd yng nghyfnod y chwyldro gan aelodau plaid yr FSLN – Frente Sandinista de Liberacion Nacional. 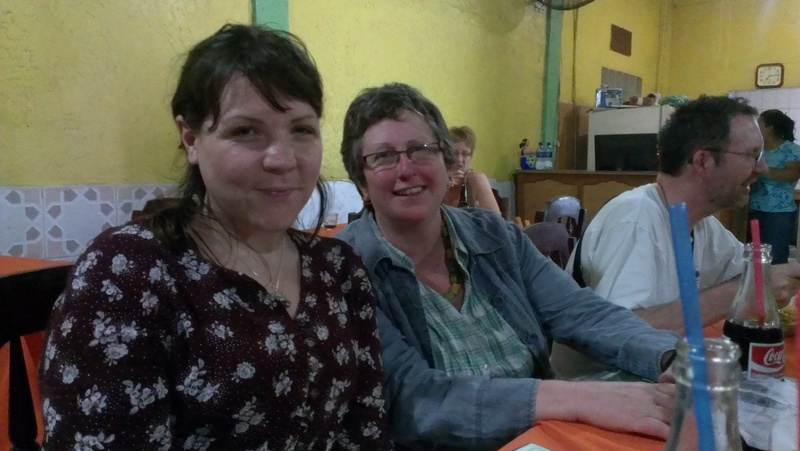 Yn wir, aeth yna filoedd o bobl i Nicaragua o sawl gwlad gan gynnwys Cymru yn yr 80au yn frigadistas i gynorthwyo yn yr ymgyrchoedd llythrennedd a gwella iechyd cyhoeddus. Roedd llawer o’r bobl gwrddon ni yn 1994 yn awyddus inni ddeall bod nhw am barhau i weithio trwy fudiadau hawliau a chydweithrefol dros newid er gwaetha canlyniadau polisi tramor yr UDA a rhyfel y Contras, diffyg diddordeb llywodraeth y dydd ym mrwydrau pob dydd pobl gyffredin ac effeithiau niweidiol amodau banc y byd a’r IMF wrth iddynt wasgu ar y wlad. I sawl un ohonom roedd yr ymweliad hefyd yn drobwynt personol ac yn werthfawr iawn o ran y cyfle i gael perspectif gwahanol ar ein bywydau a dod i benderfyniadau am newid cyfeiriad- mae yna fendithion annisgwyl yn codi o deithio a a chael profiadau newydd a gwahanol. Dros y blynyddoedd mae yna ddirprwyiaethau wedi parhau i ymweld â Nicaragua fel rhan o’r ymgyrch cefnogi. Mae pobl o wahanol gefndiroedd wedi cael eu cymell i fynd ac mae gwaith y mudiad wedi elwa o’r cyswllt cyson uniongyrchol yma. Hefyd, mae yna lot o fawr o waith codi arian, cyhoeddi deunyddiau a chodi ymwybyddiaeth mewn ysgolion wedi bod yn mynd ymlaen ac mae unigolion wedi dod o Nicaragua i Gymru ar deithiau siarad sydd wedi bod yn fuddiol- diolch i Ben Gregory am ei ymroddiad di- flino yn trefnu’r Ymgyrch ers y cychwyn. Mae Ben wedi ysbrydoli sawl un i ymddiddori yn Nicaragua a Chanolbarth America – mae ganddo stôr o wybodaeth ac mae werth ymaelodi er mwyn derbyn y cylchlythyr. Mi wnaeth ymgyrch Cymru lwyddo i godi miloedd o bunnoedd i helpu pobl Arfordir y Caribi yn sgîl Corwynt Mitch ac mae yna gysylltiad cyson ac ymarferol wedi ei wneud hefyd gyda phrosiect Los Quinchos sy’n helpu’r plant a theuluoedd hynny sydd wedi bod yn byw ar domen sbwriel Managua, La Chureca. Bydd llawer yn gyfarwydd wrth gwrs ag ymweld â stondin lliwgar Nicaragua Cymru yn y Steddfod Genedlaethol ac yn wir yn y fan yna llynedd buom yn trafod y syniad o gymryd rhan yn yr ymweliad eleni. Does dim amheuaeth bod yna fudd gwleidyddol a chymunedol o feithrin y berthynas rhwng Cymru a Nicaragua. Eleni, fel ar bob ymweliad mi oedd yna raglen lawn o gyfarfodydd i gwrdd gyda gwahanol unigolion a mudiadau – undebau, mudiadau a phrosiectau amgylcheddol, mentrau cydweihredol, prosiectau ymrymuso cymunedau a phobl ifanc yn ogystal â threulio tipyn o amser yn ymweld gyda phrosiectau Accion Medica Cristiana, AMC gafodd ei sefydlu gan griw o fyfyrwyr Cristnogol yng nghyfnod y chwyldro – mae Tearfund yn o bartneriaid AMC. Roedd cyfle i rannu profiadau a dysgu ac ail- sylweddoli rhai pethe pwysig iawn fel peidio digalonni neu ildio pan fo amgylchiadau yn eich erbyn a bod yn benderfynol i ddal ati i weithio dros obeithion ac amcanion cadarnhaol er lles pobl a chymunedau. Cawsom olwg gan swyddogion ac aelodau’r Llywodraeth ar y rhaglen uchelgeisiol mae nhw’n ceisio cyflawni i drawsnewid bywydau pobl gyffredin o ran dileu tlodi eirhafol a rhoi cyfle i bawb cael addysg a chael safon iechyd sylfaenol – mae Daniel Ortega a’r FSLN bellach nôl mewn grym. Ond cawsom hefyd glywed lleisiau beirniadol grwpiau sy dal yn teimlo eu bod wedi eu hymylu ac sydd am weld rhaglenni ymrymuso pellach megis y mudiad merched a grwp hawliau pobl hoyw. Yn amlwg, mae llawer iawn o wahaniaethau rhwng Cymru a Nicaragua o ran amgylchiadau materol a chymdeithasol ond er mor werthfawrogol oeddyn nhw o’n hymweliad a’n cefnogaeth, roeddem yn pwysleisio bod gan bobl Nicaragua lawer i ddysgu inni o ran cynnal symylrwydd bywyd a beth yw ystyr cyd- ddyheu a chyd- weithio dros gyfiawnder a chydraddoldeb a rhyddid. Mae werth nodi hefyd, o ran y cysylltiad gydag Arfordir y Caribi – mae’n ardal sy’n meddu ar elfen o Lywodraeth ac awtonomi oddi wrth weddill Nicaragua ac mae’n gymdeithas aml- ieithog ac aml- ddiwylliannol – felly mae yna brofiadau cyffredin i’w trafod yn fan na o ran perthynas grym ieithoedd mawr a bach a phwysigrwydd cynnal hunaniaeth gwahanol. Un o’r bobl arbennig gafon ni y fraint o’u cyfarfod oedd y Tad Miguel d’ Escoto. Mae’n lladmerydd amlwg i ddiwinyddiaeth ryddhâd trwy America Ladin a’r byd. Bu’n Weinidog yn Llywodraeth y Sandinistaid ac fe gafodd ei ddiarddel gan y Pâb o’r Egwys Gatholig. Creodd gryn argraff wrth inni wrando arno yn egluro ei grêd ym mhwysigrwydd gwreiddio ffydd ym mhrofiadau realiti bywydau’r di- freintiedig. Siaradodd am Iesu fel ffigwr gwrth- imperialaidf oedd yn herio awdurdodau’r dydd er mwyn ymryddhau ac ymrymuso pobl gyffredin a’r sawl oedd ar ymylon cymdeithas. Profiad grymus hefyd oedd ymweld ä chymuned gwledig Nueva Jeruslem ym mynyddoedd Matagalpa – clywed ffarmwr yn siarad am sut oedd ei fywyd wedi newid ers iddo agor ei fywyd i Grist a chael cymorth gan AMC i gael daen bach o dir i dyfu bwyd ac j gynnal fe a’i deulu – cynt doedd ganddo ddim pwrpas na hunan werth medde fe – nawr roedd ganddo ffydd, teulu, gwaith ac urddas ac roedd yn diolch i Dduw am fywyd llawen. Roedd hi hefyd yn fraint profi cwmniaeth gweddill y criw a chael cyfle i fyfyrio a thrafod yn awyrgylch heddychlon Ty’r Crynwyr, Managua.